Hideki Matsui (松井 秀喜, Matsui Hideki, born June 12, 1974) is a Japanese former professional baseball outfielder and designated hitter who played baseball in Japan and the United States. He batted left-handed and threw right-handed. After playing the first ten seasons of his career for the Yomiuri Giants of Japan's Nippon Professional Baseball, he played the next seven seasons, from 2003–2009, for the New York Yankees of North America's Major League Baseball. As a free agent, Matsui then had one-year stints with the Los Angeles Angels of Anaheim, the Oakland Athletics, and the Tampa Bay Rays. Matsui was successful in both leagues, winning the Central League Most Valuable Player Award three times in Japan, as well as the World Series Most Valuable Player Award in the United States. On July 28, 2013, Matsui signed a one-day minor league contract with the New York Yankees in order to officially retire as a Yankee. A pregame ceremony was held for him. Hideki Matsui was born in Neagari, Ishikawa, Japan (later merged into Nomi, Ishikawa). According to an interview on YES Network's "CenterStage", Matsui originally batted right-handed as a child. However, when he started playing with his older brother and his friends, Matsui was such a good hitter that his embarrassed brother insisted that he bat left-handed or stop playing with them. Matsui soon became an overpowering left-handed batter, thereafter batting left-handed. Matsui was recruited by Seiryo High School in Kanazawa, Ishikawa, a Western Honshu baseball powerhouse. During his high school years, Matsui participated in four National High School Baseball Tournaments at Koshien Stadium (once in the spring and three times in the summer). In 1992, he drew five consecutive intentional walks in a game at Koshien and became a nationwide topic of conversation. The intentional walks were considered excessive and unsportsmanlike but the strategy worked, as Matsui's team lost. Matsui's reaction to the intentional walks was widely commented upon by the media. "Matsui's stoic, emotionless conduct during those at-bats drew great praise from tournament officials and reporters alike", author Robert Whiting wrote. At the end of the tournament, a representative of the High School Federation declared that "All students should learn from Matsui's attitude." Following high school Matsui was drafted by the Yomiuri Giants in the first round. He was given the uniform number 55, which was the single-season home run record held by Sadaharu Oh. Matsui's first three seasons were unspectacular. His breakout season came in 1996, when he batted .314 with 38 home runs and 99 RBIs. A three-time MVP in the Japanese Central League (1996, 2000, and 2002), Matsui led his team into four Japan Series and winning three titles (1994, 2000 and 2002). He also made nine consecutive all-star games and led the league in home runs and RBIs three times (1998, 2000, and 2002). His single season mark for home runs was 50 in 2002, his final season in Japan. In the ten seasons he played in Japan, Matsui totalled 1268 games played, 4572 AB, 1390 hits, 901 runs, 332 home runs, 889 RBIs, a .304 batting average, and a .582 slugging percentage. His streak of 1,250 consecutive games played was the second longest in Japan. His first trip to the Japan Series became well-known. Because of the 1994–95 Major League Baseball strike, Matsui became known to the American media, as media outlets were covering the Series, which was referred in Sports Illustrated as "the" Fall Classic. In Japan, Matsui earned the popular nickname "Godzilla." The origin of the name is derisive in nature, in reference to Matsui's skin problems early on in his career, but has since come to represent his powerful hitting. He even made a cameo in the film Godzilla Against Mechagodzilla. In 2001, Matsui turned down a $64 million, six-year offer from the Yomiuri Giants, the highest in NPB history. Matsui signed with the Yankees in December 2002. A parade was held for him in Tokyo to celebrate his signing with the Yankees and many reporters and photographers followed him to MLB from his home in Tokyo. In his first major league at-bat, he hit an RBI single. At the 2003 Yankee home opener, he became the first Yankee to hit a grand slam in his first game at Yankee Stadium. Matsui went on to hit .287 with 16 home runs and 106 RBIs. On defense, he led the AL in errors by an outfielder, with 8. In the postseason of that year, he became the first Japanese player to hit a home run in the World Series, in Game Two of the 2003 World Series against the Florida Marlins. In a controversial vote, Matsui narrowly lost the Rookie of the Year Award to Ángel Berroa after two writers, Jim Souhan and Bill Ballou, refused to include him on their ballots due to his age. Yankee owner George Steinbrenner responded by pointing out that this had not prevented either writer from voting for Ichiro Suzuki or Kazuhiro Sasaki, both of whom had previously played in the NPB for several years and were the two oldest players to have received the award, and stated that he felt Matsui had been robbed. Matsui retained the "Godzilla" nickname and the song "Godzilla" by Blue Öyster Cult was often played when he went up to bat. On May 6, 2007, Matsui recorded his 2,000th hit in combined hits in Japan and the United States during a game vs. the Mariners, which earned him a place in Japan's Golden Players Club, reserved for players who have hit 2000 hits, 200 wins or 250 saves professionally. It was originally ruled an error on Raúl Ibáñez, who lost track of the ball due to the sun, but a scoring change gave Matsui the hit. Matsui went 2 for 4 that day; the second hit (#2001) was a clean single to right field. On August 5, 2007 Matsui became the first Japanese player in MLB history to hit 100 home runs. The home run came in the bottom of the 3rd inning off Gil Meche of the Kansas City Royals. On June 12, 2008, Matsui hit a grand slam on his 34th birthday, helping the Yankees to a 4-1 victory over the A's. Later that month, Matsui went on the disabled list with knee pain. He returned on August 19 against the Toronto Blue Jays and became the everyday designated hitter until undergoing knee surgery after the final game in Yankee Stadium. Through 2008, Matsui batted .294 against right-handed pitchers in his career and .295 against lefties. On June 12, 2009, Matsui hit a three-run home run on his 35th birthday, giving the Yankees a 7-6 lead over the New York Mets in the 6th inning. On July 20, he hit a walk-off solo home run with one out in the bottom of the ninth, giving the Yankees their fourth win in a row after the All Star break, their 9th walk-off win, and a tie for 1st place in the division with the Boston Red Sox. A month later, on August 21, Matsui hit two home runs and drove in a career-high seven runs in the Yankees' unusual 20-11 win over the Boston Red Sox at Fenway Park. He became the first Yankee to drive in seven runs in a game at Fenway since Lou Gehrig in 1930. Two games later, Matsui would hit two home runs for his third time in just seven games. Matsui was voted by fans as the MLB Clutch Performer of the Month Presented by Pepsi for August after his performance through the month. On September 19, Matsui hit his 26th home run of the season, breaking the Yankees' record for home runs in a single season by a designated hitter which was previously held by Don Baylor. In the 2009 World Series, Matsui helped the Yankees defeat the defending champion Philadelphia Phillies, 4 games to 2, by hitting .615 (8 for 13) with 3 home runs and 8 RBI, including tying Bobby Richardson's single-game World Series record (Game Three of the 1960 World Series) with six RBIs in Game 6. Since the designated hitter position was not used in the three games in Philadelphia, he only started the three games in New York; nevertheless, his performance earned him the World Series Most Valuable Player Award. He became the first Japanese-born player to win the award, as well as the first player to win it as a full-time designated hitter in the Series. He also became the third player in Major League history to bat .500 or above and hit 3 home runs in the same World Series, joining only Babe Ruth and Lou Gehrig. On December 16, 2009, Matsui agreed to a one-year deal with the Los Angeles Angels of Anaheim worth $6.5 million. He told Yomiuri Shimbun that he "loved the Yankees the best" but that he no longer felt valued and when his agent called to negotiate, "The Yankees had nothing prepared [in terms of contract conditions]." He made up his mind to sign with the Angels quickly. "I really felt their high expectations of me", he said. "They also acknowledged that I want to give fielding a shot." On Opening Day 2010, Matsui went 2 for 4 with a home run in the Angels cleanup spot. While playing in 145 games for the Angels, he produced a .274 batting average, 21 home runs and 84 RBIs. Matsui returned to free agent status following the close of the season, and on November 23, 2010 the Angels announced that they would not offer him salary arbitration. On December 14, 2010, Matsui signed a one-year contract worth $4.25 million with the Oakland Athletics for the 2011 season. On April 3, 2011, Matsui collected career hit number 2,500 (between NPB and MLB) at Oakland–Alameda County Coliseum versus the Seattle Mariners and on July 20, 2011, Matsui hit career home run number 500 versus the Detroit Tigers at Comerica Park. On April 30, 2012 Matsui signed a minor league contract with the Tampa Bay Rays. He joined the Rays' Triple-A affiliate, the Durham Bulls, on May 15, 2012. On May 28, 2012 it was reported that the Rays were going to call Matsui up for a game against the Chicago White Sox on May 29, 2012. Upon joining the Rays, due to his preferred number 55 belonging to pitcher Matt Moore, he elected to wear uniform number 35 for his former teammate Mike Mussina. On the first pitch of his second at bat against the Chicago White Sox on May 29, 2012, Matsui hit a two-run home run. However, Matsui's hitting was unimpressive during the next two months as he posted a .147 batting average. He was designated for assignment by the Rays on July 25, 2012 and was released on August 1. By playing for the Rays in 2012, Matsui became the first player in history to play 10 top-tier professional seasons both in America (MLB) and Japan (NPB). On December 27, 2012, Matsui officially announced his retirement from baseball. His retirement ceremony was held on May 5, 2013 at the Tokyo Dome, during which the Japanese government awarded him, and Shigeo Nagashima, with the People's Honour Award inside the ceremony. On July 28, 2013, Matsui signed a one-day contract with the New York Yankees, and formally retired as a member of the team, the Yankees organization granting his last wish in honor of his years as a successful player with the team. On May 11, 2006, in his 519th game with the Yankees, Matsui fractured his left wrist on an unsuccessful sliding catch in the top of the first inning against the Boston Red Sox. Matsui, despite the injury, threw the ball back to the infield before gripping his wounded wrist in obvious pain. The game did not count toward Matsui's streak, as a player must field for at least half an inning or take an at-bat to be credited with a game played (MLB rule 10.24). Matsui underwent surgery on May 12, 2006, the next day. He returned to the Yankees starting lineup on September 12 against the Tampa Bay Devil Rays, and had an RBI-single in his first at-bat back, and proceeded to go 4 for 4 with a walk and scored twice. It was reported in Time Asia that Matsui personally donated $500,000 towards charity relief for victims of the 2004 Indian Ocean earthquake. He also donated $620,000 to relief efforts for victims of the earthquake and tsunami of 2011 in the Tōhoku region of Japan. Matsui announced to the press on March 27, 2008 that he had married in a private ceremony in New York. His bride's name was not announced, but it was reported that she was 25 years old and had been formerly working in a "reputable position at a highly respected company". They met in Japan after the 2006 off-season. During his playing career in the United States, thirty-five Japanese reporters were assigned to cover Matsui's playing career. On March 21, 2015 Matsui teamed up with former teammate Derek Jeter to hold a baseball charity event to support children affected by the 2011 earthquake and tsunami, at the Tokyo Dome. The event included a baseball clinic and a home run derby between Matsui and Jeter. ↑ Whiting, Robert (2004). The Samurai Way of Baseball. New York: Warner Books. p. 233. ↑ Beach, Jerry (2004). Godzilla Takes the Bronx. New York. ↑ DiComo, Anthony (2009-09-09). "Matsui takes August clutch honors". MLB.com. Newyork.yankees.mlb.com. Retrieved 2010-12-07. ↑ Kepner, Tyler (December 14, 2009). "Left Waiting by Yankees, Matsui Jumps to Angels". The New York Times. Retrieved December 15, 2009. ↑ The Yomiuri Shimbun (January 1, 2010). "Angel in the outfield / Matsui welcomes new challenge in Los Angeles". Retrieved January 1, 2010. ↑ "Former Yankees Hideki Matsui, Johnny Damon Find Success on Opening Day as 'New Guys' – New York Yankees". NESN.com. 2010-04-06. Retrieved 2010-12-07. ↑ Spencer, Lyle (November 23, 2010). "Angels decline to offer arbitration to Matsui". mlb.com. Major League Baseball. Retrieved July 28, 2013. 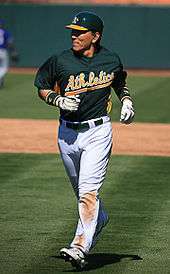 ↑ "A's complete deal to sign Matsui | oaklandathletics.com: News". Oakland.athletics.mlb.com. Retrieved 2012-03-29. ↑ "Rays sign Hideki Matsui to minor league contract". mlb.com. ↑ "Matsui homers in debut; Rays lose second straight". MLB.com. 29 May 2012. Retrieved 30 May 2012. ↑ "Hideki Matsui announces his retirement". HardballTalk. December 27, 2012. Retrieved December 27, 2012. ↑ "Hideki Matsui" in Inside the Yankees, 2007 Archived May 1, 2006, at the Wayback Machine. ↑ Kepner, Tyler (March 27, 2008). "Matsui Gets Married, and Not Just to Beat Jeter". nytimes.com Bats Blog. ↑ Hill, Benjamin (2012-05-25). "Matsui return puts spotlight on Bulls". milb.com. Retrieved 2012-05-26. Wikimedia Commons has media related to Hideki Matsui.